Italy - IOM reports that 302,486 migrants and refugees entered Europe by sea in 2016 through 28 September, arriving mostly in Greece and Italy. Some 166,610 people have arrived in Greece and 132,044 in Italy during 2016. 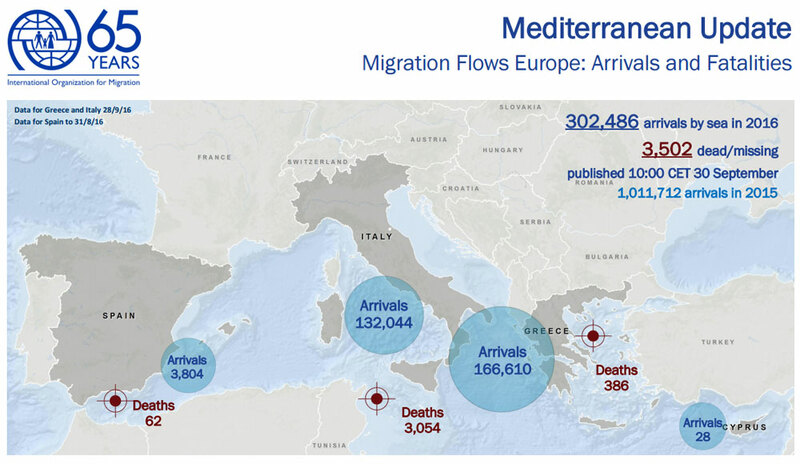 Total arrivals on the Mediterranean through the month of September in 2015 were 518,181 – nearly 60 percent higher. The death toll, however, is considerably higher in 2016 than in 2015. This year some 3,502 men, women and children have been reported drowned or missing in incidents occurring off Egypt, Libya, Greece, Italy, Turkey, Morocco and Spain. In 2015 at this time the total was 2,926. This morning IOM Turkey is reporting that Thursday, around 9:40 AM local time, the Turkish Coast Guard rescued near Bodrum at least three migrants and refugees from a foundering vessel and recovered the remains of six dead passengers. The Coast Guard reports one survivor, a Pakistani national, who said he was among 31 migrants on the vessel. The Turkish Coast Guard now reports 21 migrants remain missing, while their search operation is ongoing. If no other survivors are recovered, this latest tragedy will add 27 new fatalities to the Missing Migrants Project’s Mediterranean total – tentatively at 3,529 – or over 600 more deaths than were recorded in the Mediterranean through all of September 2015. IOM’s Cairo office reported this week that the number of deaths from a shipwreck off the Egyptian coast, on Wednesday, 21 September, has now risen to 204. Nearly half were Egyptian nationals, many of them children. At least 20 more were from the Horn of Africa. This brings IOM’s estimated death toll from this latest shipwreck to between 285 and 334 persons. That figure, together with the 3,213 IOM’s Missing Migrants Project reported as Mediterranean fatalities earlier this month, puts total fatalities in the Mediterranean in 2016 to at least 3,500 – almost as many as all of 2015, and at least 200 more than died during all of 2014. On Thursday (29/09), IOM Athens reported that the Hellenic Coast Guard rescued 140 migrants off the coast of Turkey this week in five separate incidents and transferred them to safety. Through the first 28 days of September 2,776 men, women and children landed on Greek islands – which is just under 100 per day. That number is consistent with the daily average number of arrivals during August, when 3,429 migrants and refugees entered Greece by sea. * Unofficial data collected by IOM Greece and the Greek authorities of arrivals by sea.